Showing items tagged with "Mental Health Awareness Week" - 6 found. Email overload is stressful and can also be an underlying cause of mental health issues. Hopefully you have reduced the email overload, have a clean inbox and improved your productivity and well-being. Now the trick is to keep your inbox under control and encourage others to follow suit. Email addiction is one of the major causes of email overload. It’s the feeling that you must constantly check your inbox no matter where you are, what you are doing or what the time of day. Moreover, we often default to email when of course there are a myriad of other ways to communicate. As many of you will know I am a great fan of pen and paper especially for saying thank you and taking ownership when being asked to do something rather than retorting with ‘send me an email’. How will you keep your inbox slim and control the business email overload in the coming weeks? Don’t let email rule your day. Don’t feel you must check your email either first thing in the morning or every five minutes. Rather try disconnect from time to time. The most productive people are those who prioritise their time and stay focused on the task in hand. Do you have colleagues who would benefit from managing their email more effectively as you have now done? Yes, then call us now to ask about our Brilliant Email Management master classes. Otherwise how about giving them a copy of either ‘Brilliant Email’ or ‘Taking Control of Your Inbox’? 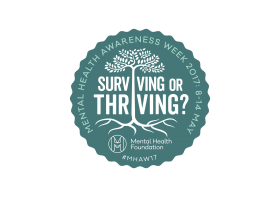 Share your progress; Email; Facebook: Twitter (using #MentalHealthAwarenessWeek) There are two prize for the two people who have made the most outstanding progress (a copy of ‘Brilliant Email‘ and ‘Taking Control of Your Inbox”). For instance, had five days of empty inboxes, reduced the number of rounds of email ping-pong by improving their email etiquette etc. Thank you for joining us for this the re-run of Clean Out Your Inbox Week to support Mental Health Awareness week We hope we have made a small contribution to helping people re-focus their work-life balance and de-stress.. Feedback on how we can improve this event for next year is always appreciated. Managing stress is about managing what is under your control. The same is true about reducing the time you spend (and waste dealing with email). To save time and reduce the email stress, you need to reduce the number of emails you receive each day. Deleting simply is not an option. You have be proactive and keep all unwanted emails out of your inbox and reduce the number of times you check for new email. here is our three stage business email management strategy to do so. How many of the emails you receive do you really need? Triage your emails as you deal with them. 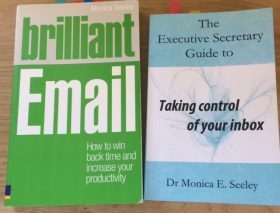 Ask yourself ‘Do I really need this email?’ ‘How useful is this to me?’ For more guidance on prioritising see Brilliant Email chapter 3 and ‘Taking Control of Your Inbox’ if you are a PA or EA. 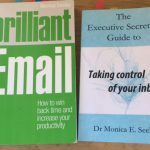 Don’t forget there are lots more tips and advice like this on ‘Brilliant Email’ and ‘Taking Control of Your Inbox’ a book written especially for PAs and EAs. Mental health issues are often exacerbated by stress at work. Email overload is a major source of stress. The real work of reducing email overload starts today. Having cleared out all the old emails, the goal is keep the inbox clean. Develop the habit of handling each email once and only once. This will help you reduce the email related stress and improve your well-being and mental health.